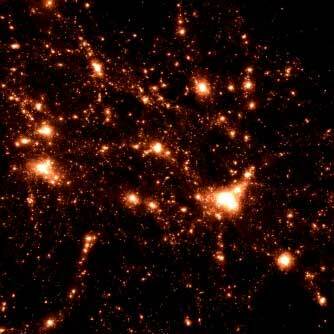 (Nanowerk News) There are hundreds of billions of stars in our own Milky Way galaxy. Estimates indicate a similar number of galaxies in the observable universe, each with its own large assemblage of stars, many with their own planetary systems. Beyond and between these stars and galaxies are all manner of matter in various phases, such as gas and dust. Another form of matter, dark matter, exists in a very different and mysterious form, announcing its presence indirectly only through its gravitational effects. From determining the initial cause of primordial fluctuations to measuring the sum of all neutrino masses, this project’s science objectives represent a laundry list of the biggest questions, mysteries and challenges currently confounding cosmologists. There is the question of dark energy, the potential cause of the accelerated expansion of the universe, called inflation. Another question is the nature and distribution of dark matter in the universe. Survey telescopes look at much larger areas of the sky — up to half the sky, at any point — than does the Hubble Space Telescope, for instance, which focuses more on individual objects. One night concentrating on one patch, the next night another, survey instruments systematically examine the sky to develop a cartographic record of the cosmos, as Habib describes it.